They wanted a free, public calisthenics area in their local park. So they took it to City Hall Fingal Civic Offices. 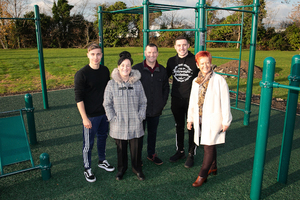 A calisthenics area has now been installed by Fingal County Council in Millennium Park in Blanchardstown, Dublin 15 after a suggestion by two Fingal residents, Anel Kvrgic and Dylan Brady. Anel and Dylan initially approached the council with the idea of creating the area to “promote fitness and health in the community”. Posted in Misc and tagged calisthenics, Fingal at 11:19 am on November 29, 2018 by Bodger. Can you sue for emotional distress if you fail to do one push up? Anel is an unfortunate first name. A lot of parks now have this open air gym equipment, I rarely see people using it in any meaningful way. Alot of parks have the air walkers and other stuff equipment. these are calistenics bars. The calistenics bars are pitched at a completely different non overlapping demographic. There should be more of them around as they are severely lacking. Personally I think the airwalkers and those machines are useless, mostly because the people they are aimed at , elderly, infirm, people completely out of shape etc, just dont use them. Also, anything with moving parts like the cardio equipment probably becomes broken and inoperable within a relatively short time exposed to the elements, and have to be repaired or replaced. Those bars will still be standing and usable years and years from now with almost zero maintenance. It’s a noble gesture, but based on my experience and observation this kind of outdoor equipment isnt used and indeed, some of the machines – the twatty air walker for example – are not going to provide any benefit to anyone. A better investment would be in running – parkrun etc – and the provision of instructors for meetups using the existing infrastructure – yoga, pilates, Fit4Life, etc.